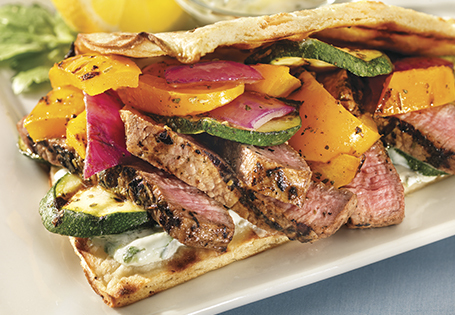 A fresh and flavorful steak sandwich. In a medium bowl, combine ½ cup marinade, 2 teaspoons Italian seasoning, 2 cloves garlic and eye of round steak. In another medium bowl, combine remaining marinade, remaining Italian seasoning, remaining garlic, red onion, zucchini and bell pepper. Marinate steak and vegetables for 1 hour each. For the sauce: In a medium bowl, combine sauce ingredients. Season to taste with salt and pepper. Remove steak from marinade and discard liquid. Grill steak for 1 minute and rotate 90 degrees and continue cooking for 1 minute, flip and repeat. Remove steaks from grill, lightly tent with foil and allow to rest for 10 minutes. Thinly slice steaks against the grain. Grill vegetables on a grill skillet until softened, about 8 minutes. Cut pizza crusts into quarters and grill for 30 seconds per side. To assemble sandwiches: Top each pizza crust quarter with 1 tablespoon of lemon cucumber sauce. Divide meat and vegetables among pizza crusts. Serve remaining sauce on side.